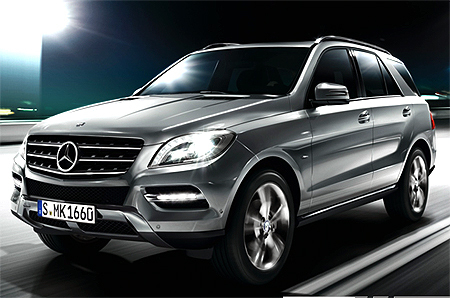 Does the all-new Mercedes-Benz ML350 CDI, launched two days ago, get it spot on? The third generation M-Class, the W166, finds itself with a job on its hands, days after its launch. 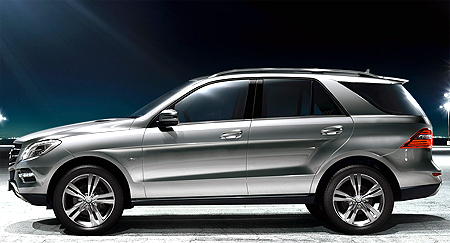 Even though the ML has sold over 1,500 units in India since its launch a few years ago, it's been a while since Mercedes-Benz has had a truly class-leading product in this category, with the likes of the BMW X5, the Range Rover and the Porsche Cayenne stealing a march over the older ML. The new car, therefore, needs to get back in the game, instead of punching below its weight. Read on to find out if it manages to do so. I'm sitting in the all-new ML350's plush cabin, enveloped in the excellent Designo leather seats, my hands gripping the meaty steering wheel and keeping the ML's nose pointed in the correct direction. The Harman Kardon audio system is belting out an old INXS song on the radio, filling the cabin with rich tonality, and the noises from the world outside are at an arm's length. The speedo shows a number that would get me in trouble with the authorities, or at least earn me a slap on the wrist, but the ML isn't anywhere near breaking a sweat -- its engine is barely ticking over as it relentlessly propels the car forward in hushed tones. I haven't been driving it for too long, but I'm already quite certain that if I suddenly decided not to return to Mumbai and continued on to, say, Delhi, I would arrive there relatively free of fatigue. That's really what the new ML is all about -- effortless, country-crossing performance combined with pleasing levels of luxury. Visually, this car makes the right start. 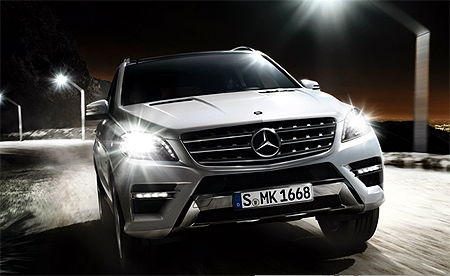 Whereas the older car didn't have as much presence as its competition, the new ML definitely stands out. It's now longer, wider, less tall and much more aggressive in nature, and the AMG package on this car contributes in no small measure. The first 100 units (all CBU) of this car will be sold with the AMG package as standard, by the way -- the CKD units that follow will have the package as an option. The 20-inch wheels, extruding wheel arches, massive grille, side skirts and bonnet-vents give it loads of attitude, and the rear (traditionally the weakest design aspect on an ML) now looks a cohesive part of the car, with E-Class style tail lamps giving it a fresh appeal. In other words, the Mercedes family look is complete. 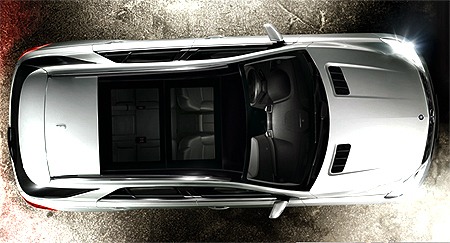 If you've been driving the older ML, stepping into this car's cabin will make you realise what you've been missing. 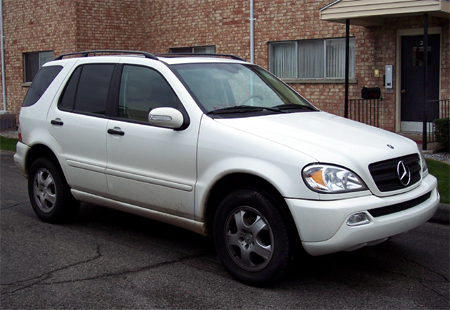 Although it wasn't exactly bare-basic, the old ML had a rather dated interior -- this one takes things up by several notches, in terms of features, build quality, space and comfort. You get features such as Active Parking Assist with Parktronic, Attention Assist (in case you start feeling drowsy while driving), nine airbags, ECO start-stop, a new COMAND dial, voice-operated Linguatronic controls, Thermotronic (they really love the 'tronic' word) 3-zone climate control, a bigger colour display, an off-road mode, hill-descent control and a whole host of others. Fit and finish is impeccable, there's now more room for passengers as well as luggage, the driving position is great and, in true Mercedes style, everything here has an air of understated elegance -- this is a cabin that you'll look forward to spending long hours in. 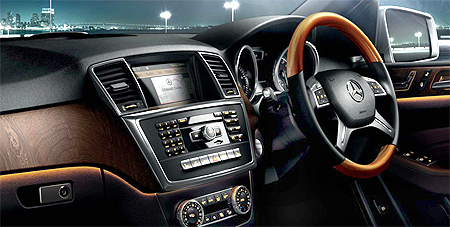 You'll also look forward to taking the wheel, because the 3-litre V6 diesel is fantastic. Now putting out an up-rated 255 bhp@3600 rpm and a massive 63.2 kg@1600-2400 rpm, this powerplant rockets the two-tonne ML to 100 kmph in 7.4 seconds, which is quick by any yardstick, and it's very refined as well -- you can barely hear it go about its business. The old cliche of a 'creamy' spread of torque applies here, with gobs of shove on offer in almost any of the seven gears. The ML is at its best at part-throttle, gobbling up the miles on the highway, but it's very easy to drive in any other conditions as well, because of the linear nature of its power delivery. The 7G-Tronic Plus gearbox isn't the liveliest one around, though, and has clearly been set up with refinement and ease-of-use in mind; that said, it's very smooth. The engine's efficiency has also been improved, and you should be able to squeeze out nearly 800 kms from its 70-litre tank (depending on how you drive, of course) -- the start-stop system, which works discreetly, has certainly helped in this regard. As for the car's ride and handling abilities, I will tell you this much right away -- if you want an SUV that's agile and involving to drive, you should be looking at the X5, Cayenne or even the new Touareg. 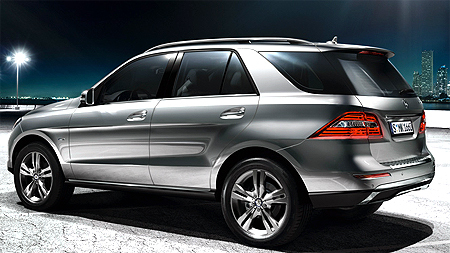 The ML has its own set of strengths, most of which have to do with solidity and comfort. Even with the suspension set to the Sport option, it offers a plush ride; in Comfort mode, it soaks up pretty much any bumps that it encounters. Its stiffer chassis ensures that at high speeds, the car is steady as a rock, and it goes around corners much better than its predecessor did, with surprising levels of grip. There are a couple of downsides, though -- the electric power steering system, although precise and accurate, isn't especially communicative, and it feels too light at lower speeds; it does weigh up when you're going faster, to be fair. Additionally, the brake pedal feel is on the numb side, even though the stoppers haul in the car's weight effectively. Does this car do enough to be counted among the big boys again, then? It certainly does -- as an overall package, it is leagues ahead of the older ML, and it offers a fine combination of performance, luxury, comfort and solidity, not to mention the added attraction of that three-pointed star on the grille. If you have Rs 66 lakh or Rs 6.6 million (ex-showroom Delhi) burning a hole in your pocket, and you're in the market for a premium SUV, you won't be disappointed if you head in the direction of the nearest Mercedes-Benz showroom.